Are you a current MailCo customer who would like to submit your testimonial or success story? Submit your story here. "We were buying lead lists from three different vendors for over 2 years and had been looking for a vendor that could provide all of our leads. Not only did we need a large quantity of leads each week, but also fresh, current records. After talking with MailCo Productions and using their data, we have been very happy with the data available. Not only does MailCo Productions provide 97% of all of our data, it is fresh and on time. MailCo Productions even sends data over the weekend to fulfill orders. I recommend this company to anyone looking for data." "In the insurance industry time to market is essential. Mailco provides us with quality data leads which minimizes returned mail and improved response rates. Saving us thousands over a year period." "After doing business with other sources in the past, it has been a pleasure working with MailCo Productions. In this day and age it's difficult to find business partners who you can rely on. When you request a service and you get more than you asked for, what more can you ask for?" Would you like to participate in our data testimonials? "I have used MailCo for several years, and found them to be the best lead source in the industry. I have recommended them to my agents, and MailCo has come through for us time after time." "I have been in the life insurance market since 1973, and have a small agency with approximately 10 agents. We submit over 1 million dollars each year in life premiums. I have gone through many, many life insurance companies for better rates, better benefits, better commission structure, etc., but the reason we are successful is our lead system through MailCo. 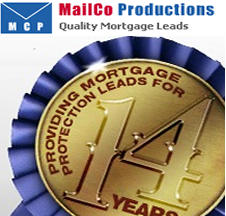 With over twelve years working together with MailCo, our agency is considered in the mortgage life market as ‘highly successful.’ Before MailCo, we had tried 20 to 30 different lead systems. Nobody can match MailCo on any level!!" Would you like to participate in our lead program testimonials? Over the years, MailCo has heard repeated stories of the success our leads have brought to producers and Marketing Organizations nationwide. We wanted to share these stories with you, and offer you and opportunity to share yours. We were a small two agent team. Our sales were okay, but it seemed as if we were getting beat to the door by other producers most of the time. We were doing our own mailings using brokered lists, and our own letter to create what we thought was a "cheaper" lead. On paper, our leads were less expensive than the going rate, but we weren’t closing on the responses. The bottom line was that our “cheap” leads were costing us sales. We were at a sales meeting, and wound up discussing our situation with a friend. They referred us to MailCo for leads. We were a little skeptical at first, because we hadn’t heard about them. What we had heard were the horror stories from other agents about lead companies maxing out there credit cards without the results they needed. Our friend assured us that MailCo was a reliable resource for leads. We called. Best decision we ever made for our business. After talking with MailCo, we decided to start small and take 5-10 leads per week to get us started. As we started getting leads, our work day changed. Rather than spending time in the office creating leads that weren’t working for us, we were making appointments and writing business. It didn’t take long for us to increase our order or the size of our office. We have increased our team to 10 producers throughout the region. Now other producers are asking us to refer them to MailCo! I was at a crossroads. Get out of the business and start a new career, or stay in and try to make a go of it. Neither option seemed feasible. I was with a larger organization on a lower commission. The big guys were getting the good leads, and I was getting recycles. I was tired and almost broke from buying large quantities of leads that weren’t getting me any appointments or premium. I had already tapped out my friends and family resources. I decided to stick with it, but I needed to change. I needed higher commission and good leads. After signing with my new organization, they gave me the boost I needed by providing me with MailCo leads. What a difference a quality lead makes! No more recycled leads. These were fresh, quality leads. Within weeks, I was back on track and building my production. Within a year, my commission level was raised, and my career was taking off. Now, I am a production manager with several top producing agents on my team. I guess hindsight is always 20/20. But I can honestly say, looking back at the crossroads, I know that I made the right choice. Would you like to participate in our Success Stories?